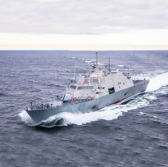 A Lockheed Martin-led industry team has delivered the future USS Billings littoral combat ship to the U.S. Navy at the Fincantieri Marinette Marine shipyard in Wisconsin during a ceremony Friday. LCS 15 is the eighth Freedom-class ship and the 17th LCS to join the Navy fleet, Naval Sea Systems Command said Monday. Capt. Mike Taylor, manager of the LCS program for the Navy, said he expects to commission USS Billings later in 2019, which will operate with the service's new fleet of warships tasked to support the country's future maritime strategy. LCS units are built to perform anti-submarine, mine countermeasures and surface warfare missions. Freedom-class variants, like Billings, leverage new integrated technologies to support various mission capabilities from deep water to littoral. 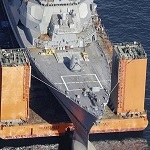 The future USS Indianapolis is slated to enter acceptance trials in the summer, while five other LCS units are currently in production phase for the Navy.